This is the wood hand plane I built in less than a week in Scott Meeks online plane making class as it appeared in the prior post. Made of quarter sawn White Oak it is my 445 Jack Plane. Named for its length in mm.,which was chosen to fill the gap in my collection of Stanley’s between the #8 jointer and the #5 jack. It is hard to know just what is the coolest thing about making your own wooden plane but building to suit your needs is one of them. 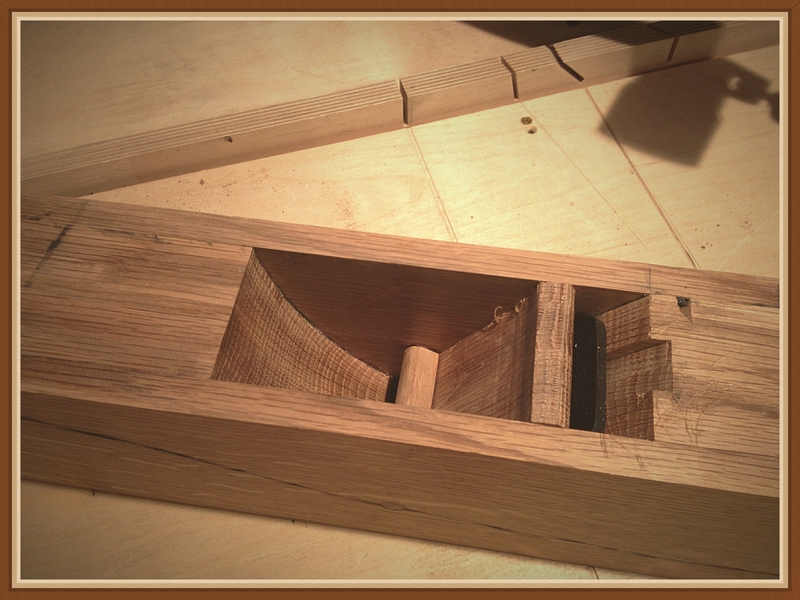 Prior to this experience I had made a 4”x1” block plane from a kit I got from Hock Tools. That was a good start. I also bought and gave a cursory reading to David Finck’s “Making and Mastering Wood Planes”. This too was beneficial because I now had lots of questions for Scott. So what was the best part of having an online class? Getting direct and specific answers to your questions that deal with what you are trying to make! And Scott makes that part easy, he never put off a question (even ill timed ones), he did not talk down and he got me and the other attendee through the project on time with success. What’s the next best part? I learned a ton and became confident that I could make another on my own (knowing that I could call on Scott if I got in trouble). And Scott’s a great guy and a heck of a teacher. Take a look at the 445 below as it is now that it is complete and working, it is still a little hard to believe and is testimony to his abilities. This project was far beyond anything I had ever done before. I have plans to make a scraper plane next. I don’t have to go into great detail about how to make a wood plane because Scott has made this experience available to everyone at a price that can’t be beat. Have you looked at taking a woodworking seminar at one of the schools? Ouch. Oh I’m sure they are worth it and I plan to take one too, but this I could do without saving up for a year. Overall I recommend this experience without reservation. Prior to this year I hadn’t even taken a shaving with a wood plane. So things can change quickly for the better with a little help. This entry was posted in Beginnings, Hand Planes and tagged wood plane, woodworking classes. Bookmark the permalink. Thanks for the nice write up Al! When I saw the photo of your plane, I had a flash of memory of Pappy’s (Eric Flinck) plane with those amazing, mystical curls of wood that to a little girl of maybe 4 or 5 seemed too wonderful to believe. I carried them around until some grumpy parent made me throw them away. I’ll never forget the wonderful aromatic ambience of holding them in my hand.